1. The stained-glass window in the south transept was gifted by the 1st Battalion The Queen’s Own Cameron Highlanders. It was unveiled by the Colonel of the Regiment, Major-General N. J. G. Cameron, on 23rd December 1930. It replaces the one gifted by them to the old "Iron Church" in 1912 to commemorate the battalion’s stay in Aldershot (1909-1913). It was destroyed when the "Iron Church" was demolished. 2. On Sunday the 18th Nov. 1934 His Royal Highness The Duke of York unveiled the stained-glass window in the apse. This window is Scotland’s tribute to the memory of Field-Marshal The Earl Haig. It was designed and executed by Mr. Walter J. R. Cook, Edinburgh. 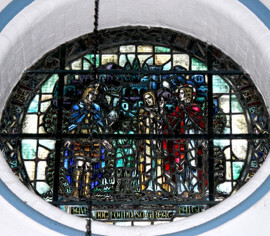 The subject of this window is that of the supreme sacrifice of our soldiers as symbolised by the crucifixion of Christ which occupies the centre part of the window. On either side of his cross hover adoring angels with the sun and the moon at their feet symbolising the light and the darkness which descended on the earth. Behind all, the rainbow of hope is seen, above the Christ descends the Holy Spirit in the form of a dove. Behind flow the Waters of Life. On either side a small angel holds the Martyr’s Crown and the Crown of Thorns. At the feet of Christ two angels are seen holding the symbols of the Communion, the Bread and Wine. In the sky which has opened appears the vision of the Holy City. At the base of the Cross the mother mourns her son, while a second woman prays and a disciple, setting out to carry on the work of Christ, endeavours to comfort both. This group represents the country mourning her dead but preparing to carry through the cause for which the men died that their death should not he in vain. Above these figures is the symbol of woman’s sacrifice, the pelican feeding her young with her own blood. At the base of the window, surrounded by the names of his most famous battles, are the arms of Earl Haig with crown, helm, crest and supporters. Underneath is the Order of the Thistle, springing from behind the scroll of battle names is the Tree of Life, which encircles in the centre of the window a mourning Scottish soldier kneeling on the poppy-covered grave of a comrade. Outside is represented the Scottish thistle and the Flanders poppy. On the left, encircled by the foliage of the Tree of Life and surmounted by the Lion of Scotland, are four quatrefoils depicting from the base up (1) the engineers repairing a bridge over a river; (2) the infantry preparing to charge the enemy lines; (3) the War as fought in the air; (4) the British tanks advancing across no man’s land, on a shattered German trench. On the right, in the same order and surmounted by a Shield bearing the Cross of Saint Andrew, we have (1) The Medical Staff represented by a Base Hospital; (2) A Cavalry Skirmish; (3) The men who manned the Troopships on the Channel during the Submarine peril. The Bridge of a Commandeered Tramp Steamer is seen; (4) The Artillery, a camouflaged Big Gun in action. 3. On Sunday the 29th Sept.1935, the window in the west wall, gifted by the Countess Haig, in memory of all ranks of I Corps who fell in 1914, was unveiled by Capt. Sir Ian Fraser, Chairman of St. Dunstan’s. Mr. Walter J. R. Cook designed and executed this window also. The subject of this Window is Peace, as fought for by the men of the First Corps in 1914, to whom it is dedicated. The upper portion symbolises this by showing the figure of Christ walking alone, in the poppy-covered fields of Flanders, His hands stretched out in blessing and hope. Behind Him is seen the Holy City, the New Jerusalem, symbolising as it does the rebuilding of the many ruined towns and villages of France. Above the Christ is seen the symbol of His sacrifice, the Cross and the Martyr’s Crown. On either side the Herald Angels loudly proclaim Peace on Earth. Below is shown the miracle of Mons. A soldier of the First Corps, in battle-order, stands amid the smoke of battle, shielding his eyes as he gazes towards the Light of the vision seen during the heavy fighting. Behind, St. George, Patron Saint of all soldiers, shelters him beneath his banner, while an angel prays. Kneeling at his feet, another angel points in sorrow to the destruction there, of broken wire, shattered trees and torn earth. At the base of the Window above the name of the First Corps are the Heraldic Arms of their Commander, Earl Haig, with those of Lady Haig, the donor. On the left a mourning mother prays, while on the right, youth, symbol of the new generation, looks toward the future in expectation. On either side are the Battle Honours of the Corps - Mons, retreat from Mons, Marne, Aisne, Ypres, Langemarck, Glieluvelt, Nonne Bosschen and Givenchy - while the Arms of the four countries of the United Kingdom are shown surmounted by a Royal Crown. 4. 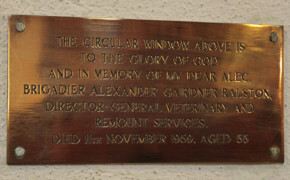 The circular window on the south wall of the chancel was erected in 1962, in memory of Brigadier Ralston, Director-General Veterinary and Remount Services, by his widow. It depicts the incident recorded in Luke chapter 7 when a centurion first sent Jewish messengers to ask Jesus to heal his servant, then when Jesus was near the centurion’s house, the centurion sent out his friends to Jesus stating that he did not consider himself worthy to speak to Jesus directly just say the word and my servant would be healed. Jesus responded that he had not seen such great faith even in Israel. 5. 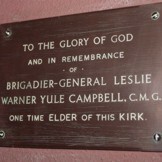 Brigadier-General Campbell, C.M.G., Elder of the Kirk. 6. 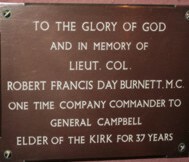 Lt. Col. Burnett, M.C., One time Company Commander to General Campbell and Elder of the Kirk for 37 years. 7. Second Lieutenant Wingate, who died in action in France in 1915, aged 21. 8. General Wavell of the Black Watch. 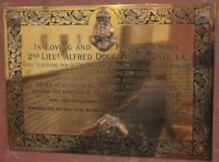 This tablet was originally in the Wavell Memorial Chapel, which ceased to be used as a place of worship in 1965-66. It was rescued from oblivion in 1967 by the Senior Scottish Chaplain and erected in its present position in the north transept. 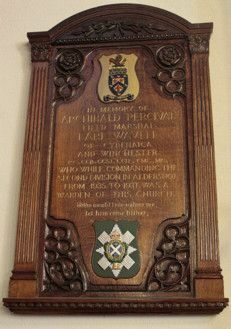 General Wavell worshipped in St. Andrew’s with his Regiment.9. 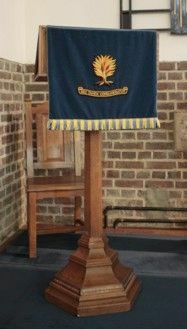 The lectern in the Cameron Chapel was presented to the church in memory of the ministers of the Presbyterian Church in Ireland who fell in the Great War of 1914-1918. 10. 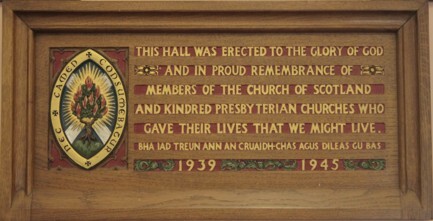 The church hall was built as a memorial to all presbyterians who gave their lives in the Second World War. It was opened on the 29th of November, 1959. Also in the church are some reminders of the days when the British Army spanned the world. 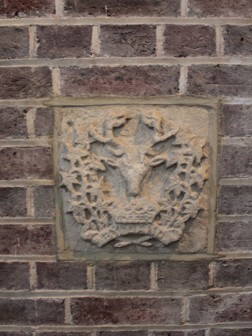 There are a dozen regimental crests of Scottish Regiments, chiselled in soft Arabian stone. 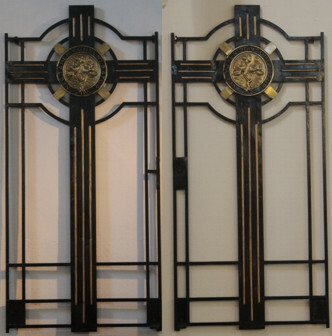 There are also two wrought-iron gates with the burning bush of the Church of Scotland worked in beaten metal on them. The stones and gates were made by German prisoners of war and were originally in an army church, which, at the time of its construction, was known as St. Andrew’s Kirk, Geneifa, Egypt. The regimental crests (which are those of the regiments which were serving in the Canal Zone at the time the kirk was built) decorated the apse of the church and the gates were hung at the entrance to the church grounds. The Egyptian church was closed around 1956 and the crests and the gates were eventually moved to Cyprus, where the Argyll and Sutherland Highlanders used them to decorate their kirk at Limni Camp. After a fairly brief stay in Cyprus the stones and the gates were brought to Britain by the Royal Air Force, this was in 1961. Their travels ended when they reached St. Andrew’s, Aldershot.